For the past few weeks since we hit full term, I feel as though I can hear the earth’s clock ticking. Each profound second, a thick, dull thud, slowly yet steadily creeping round the bend until yet another full minute has gone by. It’s how funny life works. How patience works. How ridiculously emotional one can be. How one week you can be praying for more time, for things to stretch out and linger, and in the subsequent one, wishing life to fly by and land on one precise dot, that future moment you’ve been dreaming about for months. How silly we are to wish for things to hurry up, then slow down, and then hurry up again and just happen already. I am guilty of such thoughts, but in taking a step back I see just how wise God truly is, always keeping us in a place of need and on our toes…Gently suggesting through our trials and sufferings that we bend our knees and offer our worries and woes up to him, helping us see that the answer lies in surrendering and inching away from the illusion that we are in control of his plan. As our family anticipates the arrival of our little one (who is due to arrive any day now) we are met with every emotion. We are already three weeks past when we delivered our other babies meaning that we will not be delivering a preemie. Amazing new! Interestingly enough, I did not go on progesterone with this pregnancy, however I did get steroids just in case our sweetie needed lung support if early like his/her brother and sister. All of this being said, we are overjoyed to have made it to this point. But now that I have reached that full-term mark, I am finding that I am feeling rather ready to get labor going. Seriously, Amanda, settle down already. Enough with the wanting! 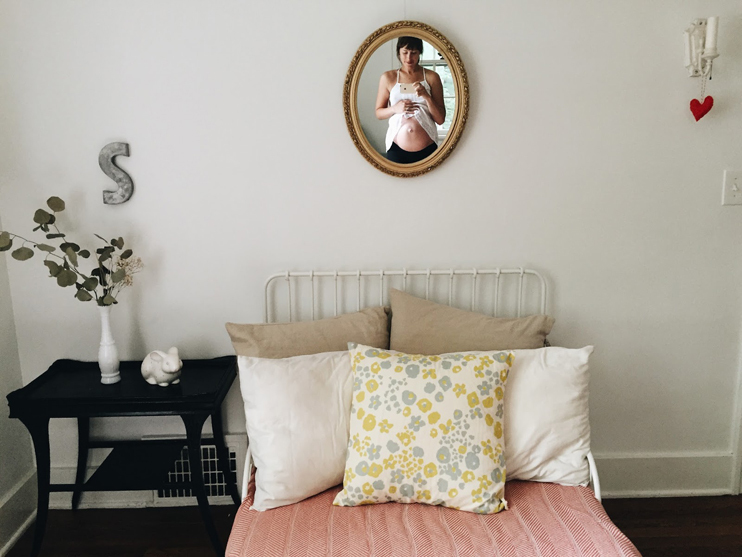 But if i am being honest here, I have grown tired of the scores upon scores of contractions that that have taken over by tightening and paining my now very sore body. As I lay on the couch or bed, I’ll feel one coming on and so I’ll start the timer on my phone, only to find out an hour later that they were false. And so it goes. But with each twinge and long pause, my hands gripping the corner of a pillow, I know that they are not in vain. My body is smart and strong and is getting ready by testing my weary self, preparing me for an impending time when things will indeed be real and I will have needed all that prep work in my back pocket. As for other things I am learning on this journey, let’s throw “embracing the now” into the mix. As the shadow of my belly outstretches over my red painted toes, I am learning how important it is to be present. To stop thinking that happiness lies in something based in the future, no matter how badly I want it. To soak up the richness of all that is right now, albeit quite plodding and pokey, and enjoy these final moments as a family of four. To relish in our weekends of waking up slowing and reading the paper and chasing the kids around the yard. To having no plans and keeping it that way. I love that when I need a good nudge out of my anxiousness, Andrew is right there to remind me, “Let’s take one day at a time, honey.” And he’s right. one day, one hour…to allow this slow drip commence and consume us, not in a way that ushers in impatience, but one that fosters gratitude for the gift we’ve been given to grow a healthy baby. Thank God for that. Lately I’ll catch myself thinking back to that newborn smell, the one of softness and sweetness, the smell that fills up a mama’s heart right after they’ve been born. I’ll reminisce, longing to breathe it in. I’ll think about that and the whole experience of delivery, taking a deep breath, aware that in a matter of a few weeks (or more realistically mere days) I will get to experience this all over again, but with time most likely no NICU. I dream of our doctor placing our tiny babe in my arms, rather than being whisked away only to be hooked up to tiny wires and tubes. These thoughts, among other things such as sticking to routine are helping me stay calm. Each chore accomplished and each fading sunset reminding me that we are getting closer to meeting our baby. However, I would be amiss if I did not tell you that there are indeed other times, more fast paced ones, when growing this baby and nearing the finish line feels more like I am running full speed down a steep hill, making me give into the momentum that is carrying me. This momentum, however scary and powerful, is giving me grace and forcing me to let go. To again surrender, and know that God, not me, has this. In the thick of this imbalance where calm and crazy meet, letting go is what wins. It’s what gives me permission to go about life peacefully, presently, laced with a glowing lining of thankfulness. So as the hours tick on and we wait for our precious baby, we will be keeping to the rhythm of our everyday. A load of laundry in the morning, followed by coffee and something sweet. Painting and drawing before nap time, followed by lunch on the porch, even if it’s raining outside. Our later afternoons filled with puzzles and playing with tractors. A simple supper prepared, nothing too fancy, flavored with herbs from our garden. And before bedtime, few books, bubble baths, and maybe a movie. And so we wait.